PURE + NATURAL Extreme Fit 180 is a premium natural weight loss supplement which helps control hunger & reduce craving naturally & effectively. These green coffee bean capsules are made of a high grade blend of raw Arabica coffee beans. LOSE WEIGHT AND KEEP IT OFF- We all need an extra boost. Our natural green coffee bean extract for weight loss will help boost your metabolism, thereby helping you burn fat & keep the pounds off your body. ANTI-OXIDANT POWER-These pure green coffee bean supplements contains a unique antioxidant called polyphenol chlorogenic acids or CGAs. This helps protect the body's cells and organs from environmental damage so that you and your cells remain younger for longer. POTENT and EFFECTIVE - These vitamin capsules contain potent & powerful ingredient. Our 100% pure green coffee bean extract is gentle but effective. Our green coffee bean extract is made with only the best, premium, and natural ingredients so you know what you are putting into your body. By taking 2 pills a day you will feel fuller and satisfied for longer. 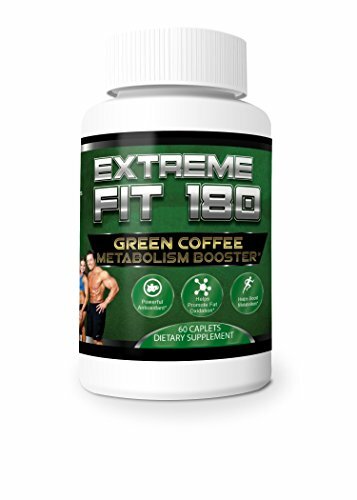 Plus our green coffee bean extract is a powerful fat burner and metabolism booster. If you have any questions about this product by Extreme Fit 180, contact us by completing and submitting the form below. If you are looking for a specif part number, please include it with your message.